It doesn’t get much better than Laurie Lewis & the Right Hands. She’s Berkeley’s own, she’s won the International Bluegrass Music Association award for Female Vocalist of the Year multiple times, not to mention a Grammy for her contribution to True Life Blues: the Songs of Bill Monroe, and her Right Hands are about as talented as a band has a right to be. Laurie sings and plays fiddle, if you don’t already know, and she may strum the guitar now and then. Tom Rozum sings and swaps jokes and plays mandolin, Chad Manning plays fiddle, Patrick Sauber plays banjo, and Sharon Gilchrist plays bass. Truth is, they all play a lot of things. If you’ve never heard them before, you need to hear them as soon as you can. And if you’ve already heard them, chances are you want to hear them again. 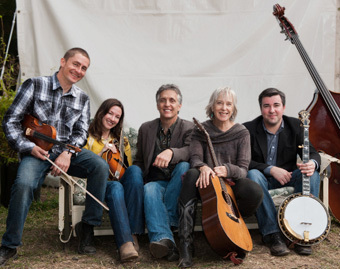 Since her graduation from Berkeley High several years back, Laurie has become a key figure in bluegrass, traditional, and folk music circles. Tom adds masterful mandolin, mandola, guitar, superb vocals, and his own particular brand of wry humor. The lineup of the Right Hands changes now and then, but the caliber of musicianship always remains high. They’ll make you laugh, they’ll bring a tear to your eye – don’t miss Laurie Lewis and her Right Hands in their musical home at the Freight.